In 2002 I was playing for the Singapore National 7-aside rugby team. We were heading to the Hong Kong Sevens rugby tournament to play in what would be my first time at this event. For those who don’t know the Hong Kong 7’s, it is the most prestigious international 7’s event in the world. The stadium is packed with close to 30,000 screaming people, drinking beer, having fun and watching some of the biggest, fastest and hardest athletes on earth battle it out. With the national teams from rugby powerhouses such as New Zealand, Samoa, England, Fiji, Australia, France and South Africa present, the Singapore National team drawing from its pool of a few thousand players, would always be punching above its weight in this tournament. It had been a dream of mine for many years, ever since I was a 13-year-old boy, getting up in the middle of the night at Boarding School to sneak into the TV room and watch the finals of the mighty HK Sevens on television, that one day I would get to play in such an event. It never seemed like reality while I lived in New Zealand as I would never be able to make it into the NZ sevens team (which along with Fiji is the top team in the world). When I moved to Singapore I realised that there was an opportunity for me to make the Singapore national side and potentially if I worked very hard, make it to this magnificent event. A few weeks before the tournament, I was playing well and was pretty sure of my place in the Singapore National side. When the draw was read out for the HK 7’s tournament, Singapore’s first game was to be against Fiji on the Friday night. Of all the teams in the entire tournament, Fiji was the least most attractive team to have your first game against! The players are monsters, with average heights/weights of well over 6 feet/100kg, they are huge and fast and very skillful. The last few weeks leading into the tournament I had a severe case of nerves. I ate, slept, dreamt, worried about that first game against Fiji. How would I make out playing the best 7’s players in the world in front of live Television and thousands of people. Would I make a complete idiot of myself? Would I get smashed into a thousand pieces? Or conversely would I play very well, would I be a star? The time finally same to run on the pitch and do battle against Fiji. The game went by in a blur. Reflecting back on it I can hardly remember anything about it, except on the field it was strangely quiet and I forgot completely about the occasion and where I was and was just focusing completely on the rugby. We got thrashed by around 50 points, however I do remember making tackle after tackle after tackle, and thinking to myself, these guys maybe big but they still fall down if you wrap up their ankles! I got through the game unscathed and went into the next day’s tournament to play Wales in the morning. We played very well, only just losing to them in the second half, after a strong first half. The afternoon’s game was to be our match of the tournament. Singapore v China. Finally a game where we had a chance of winning. China obviously were as equally excited about the match and both teams got stuck in from the opening whistle. During the second half I got hit in a freak tackle, where one player was holding the top half of my body and another player dove at my legs. The result saw my ankle dislocate and my leg shatter and as I fell to the ground I could hear this very loud sound ‘pop pop pop’ which I later realized was my bones snapping and my ligaments tearing in my ankle. 0ne hour later, I was lying in a HK hospital, being wheeled into the operating room. My lifelong dream had ended in the space of 10 seconds on the field. To go from the excitement of running around in front of 25,000 people, realising your dream – to lying in an operating room being told I would not play rugby again for a long time if ever, was and still is one of the largest shocks I have ever received in such a short space of time. I got very depressed over the next few weeks, while coming to terms with my new life of a ‘sit at home’ invalid. The change from training every day and travelling around the region playing the game you love to being a couch potato drove me crazy. I did slowly start to improve my emotional outlook and eventually physically recovered enough to make it back to the HK sevens as a player 2 years later. However it did take some time and I remember there being many miserable moments during those first few months. Its only 4 weeks to go until I leave for Everest. Finally the reality of what I am attempting to do is hitting home. As with the HK sevens I am starting to get nervous. As with the HK sevens I am eating, sleeping, dreaming and worrying about Everest. How will I fear on the mountain? Will I make an idiot of myself? Will I get smashed? Or will I go well and make it to the summit and back down safely again. Always at the back of my mind is the feeling, what if I don’t get there? Statistically there is a very strong chance I will not make it to the summit. There are so many things that can go wrong on the mountain. I give myself a 20% chance of summit success on Everest. It has taken me multiple attempts to climb many mountains in the past, including Mt Cook and Mt Aspiring in New Zealand, even the training climb on Malte Brun last month I will need to re-visit in a second attempt sometime in the future. 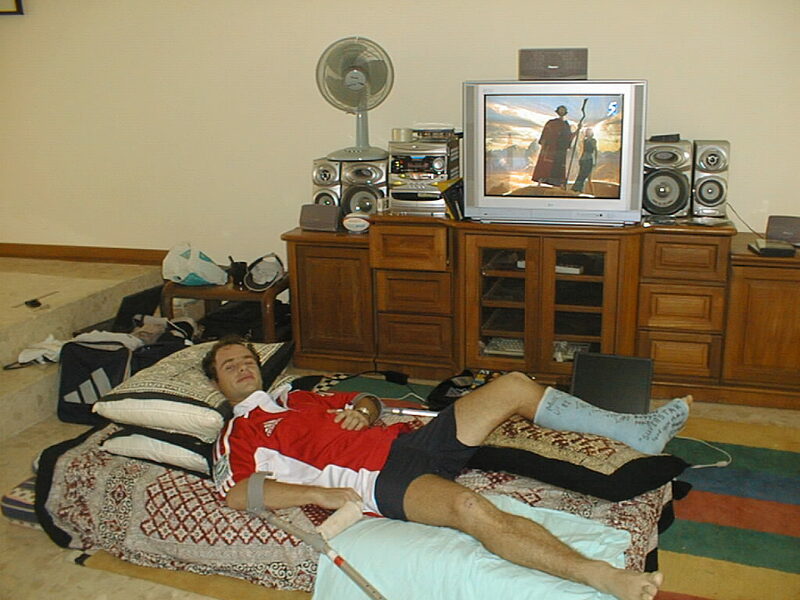 If I don’t summit Everest in 2011 – I am scared of that feeling I had after the HK sevens in 2002. The feeling’s of depression, self-pity, frustration and anger. Bottled up emotions which tend to be vented on those people closest to me and whom I love the most. I am trying to prepare mentally for not making it to the summit. My friend Alan Silva who climbed Everest previously gave me some good advice. He says, choose milestones on the mountain. Choose base camp as the first milestone to reach. Make sure you are aware of the history of the climb and the great men and woman who have gone their before you. When you get to base camp, be happy that you have reached this point. Enjoy being there in such a historic place, where so many incredibly tough, talented and brave explorers have been before. Then choose the next milestone. Advanced base camp, then the North Col. Choose a point where you are happy to get to and will deem the expedition as a success personally – which is not necessarily the top. I am working hard on trying to constantly remind myself of this philosophy. It does not mean I am going there without enormous motivation and drive to reach the top. However deep down I know not making the summit may be painful to bear, after all the hard work of raising money for the climb and for the charities, the toil of physical training and the emotional stress I put my loved ones through, it seems cruel that the mission may not be a success. As the saying goes, it is how we deal with failure that determines how successful we are. And for me, I would always rather attempt something and fail, than never attempt anything and succeed. Thank you for reading my latest blog post. If you like it, and know of other people who may like it – please pass it on and get them to sign up. When I leave in 4 weeks time, this will be the only way I will be able to update you all on my progress on the mountain. Posted on March 2, 2011, in Everest 2011. Bookmark the permalink. 10 Comments. You;re a winner for choosing to go , to live , and to experience the climb. Reaching the top is not the main aim, coming back alive is…that’s what Daisy always tell me. You already have the courage to start, may you have the strenght to endure and resolve to finish the climb! Hey, chin up bro! Ya, take 1 thing at a time and before you know it, you would have made your mark on Everest and will be home to tell us all about it. You’ve invested too much to fail! It’s better to have loved and lost than to never have loved at all and I know you love mountains and football as much as I(and I don’t even play). You would know, it ain’t the goal it’s the journey. How many people couldn’t even think of doing what you are about to attempt. You’ll be a big man to many whether you summit or not. You are inspiring old mate! Thanks for the responses guys! Much appreciated.. I did not mean my blog to sound negative about my feelings for Everest – its just an honest reflection on how I am trying to deal with facing the possibility that I may not reach the top. But in general I am really pumped to get there and get onto the mountain!!! C’on Grant you can do it ,after all you’re a ‘naki boy !! Deb forward through your blog details, so have jumped on to have a look, it looks awesome and looking forward to watching your progress! The olds loved the wedding also! I hope you don’t mind but have given the headmaster a heads up so the school can follow your progress and he wanted to see if he was able to contact you also? Is this ok?, as it looks like you could be NPBHS 1st old boy to attempt and hopefully conquer the mighty beast! Johnny! Thanks for the mail – I wanted to get in touch with the principle actually as am trying to raise some $$ to send some boys from NPBHS and Spotswood to Cambodia on a programme… If you can ask him to contact me would be great. You need to sign your email address into my blog on the home page to automatically receive my updates from the mountain..
Will keep you in thoughts and prayers.